General Info - Vounaki lies on the Ionian Sea. This popular yacht charter area combines both good sailing weather, sunny and warm with predictable winds with a fascinating group of islands. Navigation is generally by line of sight and a passage between islands is generally only a few hours in duration The islands are attractive and steeped in Greek mythology. The Ionian Sea is a great place for people learning to sail or building experience and so it is no surprise that it is home to several companies running flotilla sailing holidays. Levkas is a popular, lively and windy island. It is the only island linked to mainland Greece, a swing bridge providing access by road. The airport at Preveza is only a 30 minute ride away. Lefkas Town lies a short distance down the canal, at the point where the canal turns to run SE. The buildings of the town are easily seen and the harbour is not difficult to locate. There is a marina here or you can use the town's harbour. 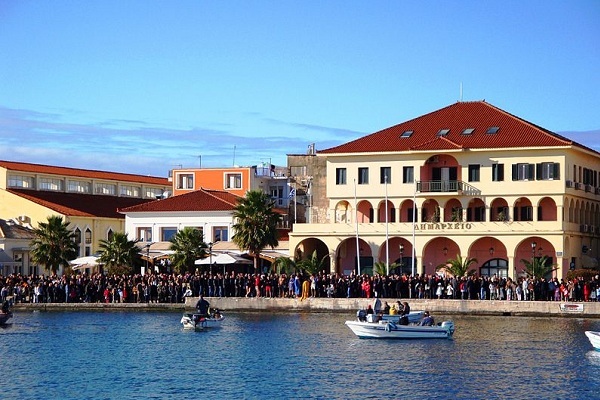 Both provide good shelter in all weather conditions .The Lefkas canal enables sailors to pass along the east side of the island, which has most of the anchorages. The northern entrance can be found by locating the Santa Mauro Fort. The canal proper starts after Lefkas Town and is marked by red and green poles and by red and green buoys when the canal turns south. 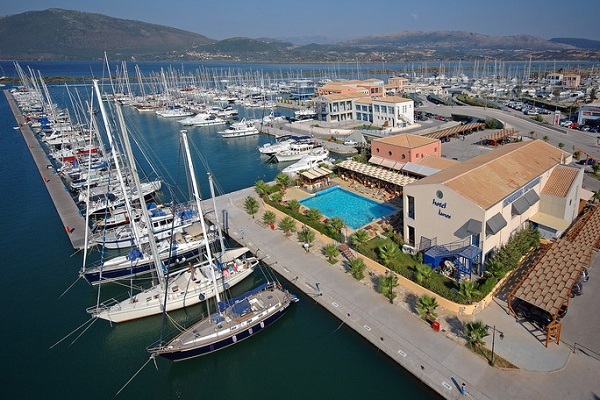 On the southern end lies the sheltered bay of Sivota with several waterside bars and tavernas. On the southwest coast, Vasiliki has quayside bars, cafes and non-stop nightlife. Vassiliki was a sleepy little fishing village. It is now one of the islands main resorts The port is located in the south-east of the large bay. It offers good shelter although the prevailing wind tends to blow into the harbour making conditions uncomfortable at times. The bottom holds well. There are no anchorages on the west coast but you will find beautiful beaches where you can watch stunning sunsets. Also worth a visit while on Levkas: The ancient city Nirikos was the first capital of the island from 2BC. Excavations have shown that Nirikos enjoyed significant economic growth. The collection in the Archaeological Museum of Levkas includes findings dating from the Proto-Hellenic period to the Roman era, including ceramics, pots, statues, signs, ecclesiastic pieces and photographs from the excavations in Nidri. Lefkata Cape is situated at the southern part of Lefkas and offers a majestic view. Originally, sacrifices to the gods and spirits took place here. Convicts were forced to jump from the rocks and attempt to fly using feathers tied around their bodies. The monastery of Panayia Faneromeni is the most significant religious monument on the island. It is situated 2 km east of the capital outside the village of Frynio and stands on the site of an ancient sanctuary for Artemis or Hera. 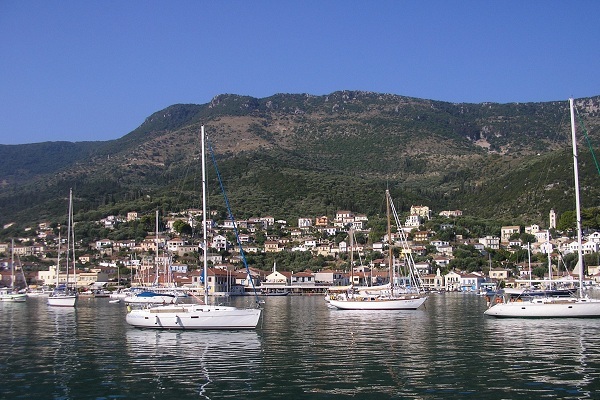 Ithaca - Steeped in legend of Odysseus the island has beautiful bays and attractive anchorages. The island is essentially two heavily wooded mountain tops rich in flora and fauna, which protrude steeply from the Ionian sea, joined in the centre of the island by a thin stretch of land. It offers gentle green uplands in the south and rugged limestone hills in the north. Frikes is a small harbour and village in the north east of Ithaca set in the bay that it takes it's name from. A lovely place at the bottom of a steep wooded valley. There are several old windmills standing on the rocks above the village. Kioni lies just to the south of Frikes. The village is stunning with buildings dotted around the steep slopes of the bay. The bottom is mud and weed and care must be taken to get the anchor holding. Shelter is generally good but there are often gusts from the north west. There are shops in the village and tavernas on the waterfront. Further to the south is Vathi, the island's capital and main harbour. It's red-roofed houses set among enchanting scenery at the end of the closed bay of Molosmeans Vathi means deep and that's what you will find. The bottom is a combination of mud and weed and care is needed to make sure the anchor is holding. There are plenty of shops and tavernas in the town. Three kilometres to the northwest lies the Cave of the Nymphs where, according to legend, Odysseus hid the gifts bestowed upon him by the Phaeacians who delivered him to his home after his many adventures. The bay of Polis on the west coast, near the village of Stavros, is the site of Loizos' cave. A couple of interesting finds have been made here: Shards on which were carved inscriptions testifying to the worship of Artemis, Hera and Athena and twelve tripods similar to those which the Phaeacians gave to Odysseus. Cephalonia is the largest of the Ionian islands covering some 700 sq. km. It is renowned for its wine and more latterly for the novel Captain Corelli's Mandolin by Louis de Bernieres. For the walker there are acres of forest covered limestone mountains to explore. 10 peaks rise above 5000 feet. The limestone rock results in remarkable caves and caverns as can be seen at the underground lake complex at Mellisani. Most of the mountains fall steeply to the sea and the you will be sailing at the foot of these peaks, in places this means the boat will be subjected to strong gusts of wind so care is needed. Fiskardo is an enclosed bay and harbour on the north eastern tip of Cephalonia. It is an extremely popular stop for yachts and in the summer months the quay is normally packed. If there is no room anchor in the north of the bay and take a line ashore. The harbour provides good all round shelter. The village is picturesque and was one of the few places on the island that escaped the terrific destruction of the 1953 earthquake. Hence 19th century houses set amid green pine groves remain pretty much original and a historical preservation order should keep them that way. There are a number of shops in the village as to there are tavernas some serving excellent food. There are several anchorages on the coast between Fiskardo and Ay Eufimia to the south. Ay Eufimia is a small harbour in the north west corner of a large bay. Most provisions can be found and there are a few tavernas. Sami to the south of the same bay is the island's main ferry port. It was developed after the earthquake and is nearly all modern buildings. There are good walks along the coast to the north east of the harbour. Still further to the south is the small harbour of Poros. This is not the most comfortable harbour in the Ionian with the prevailing winds creating a chop in the harbour. It is uncomfortable rather than unsafe. Most provisions are available in the village. There are several tavernas with a good one by the harbour. The capital of the island is Argostoli the SW. The earthquake in 1953 bought almost total devastation, all that remained intact were a couple of houses, the arched bridge stretching across the lagoon and the obelisk at it's centre. Sadly the rebuilding has produced a rather soulless place. There are plenty of shops and tavernas in the town. Lixuri is a town with a small harbour opposite Argostoli on the western side of Kolpos Argostoliou. Unfortunately the harbour is situated next to the main sewer outlet and is extremely smelly during the summer months. Assos, on the western side of the island, should be used only in calms or when the wind is light from the west. There are numerous tavernas in the village and limited provisions can be found. The village is particularly picturesque set under the high cliffs and mountains and just across the peninsula from the ruined Venetian fort. 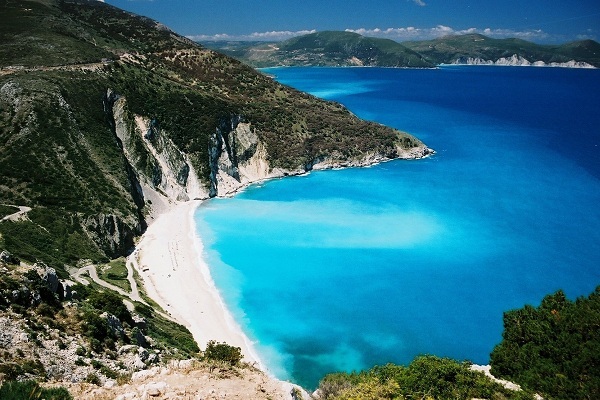 Zakinthos is the southernmost of the islands in the Ionian. A horseshoe shaped mountain range surrounds a rich fertile plain. Half of the island's cultivated land is given over to the currant vine which was originally transplanted from the Peloponnese by the Venetians. In the north east of the islands lies Ormos Ay Nikolaos. You can anchor in the bay in about 5m depths or go stern to the outside of the breakwater and take a long line ashore. Strong gusts can be expected in the afternoon and most yachts leave after lunchtime and head south to the capital. A visit to the Blue Caves is a favourite in this part of the island. Join one of the local caiques as visit with a yacht is not advisable as the area is unprotected from north westerlies and the waters to deep to anchor in. The underwater rocks are covered by a mauve coloured seaweed. The seaweed together with the white sandy bottom of the caves reflect the incoming sunlight producing a blue hue. To the south lies Limin Zakinthos, the capital of Zakinthos and most of the island's 35,000 population live here. The town surrounds a large harbour. It was devastated by the earthquake in 1953 but an attempt has been made to rebuild in the original style. When inside the harbour care is needed of the semi-sunk stone breakwater which protrudes from the north mole. Yachts should make for the designated yacht quay within the harbour. There are several museums in the town devoted to the islands history. Porto Roma lies in the south east corner of the island. This is a wonderful anchorage in calm weather. There is a taverna on the beach. The southern coast and beaches are host to the last and most important concentration of Loggerhead turtles' nesting sites in the Mediterranean. From May to November this area is subject to restriction regarding access by vessels. It is advisable to check with the authorities in the capital what restrictions are currently in place if you are planning to sail in this area. Ormos Keri lies at the western end of the restricted area. Anchor either side of the stone mole and take a long line ashore. Be aware of the underwater ballasting protruding out from the mole. 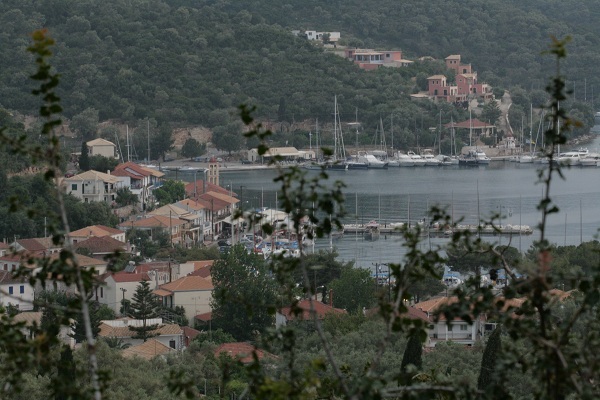 Ormos Vroma is the only anchorage on the western side of the island. Anchor on the northern side and take a line ashore. 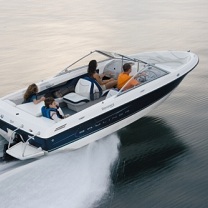 Charter Season - Some of our yachts can be hired year round. While November to February see many sunny days with pleasant temperatures they also see a number of stormy days accompanied by heavy rain. July and August are the most popular months, they also tend to be the most expensive and many marinas and resorts will be very crowded. The months either side of the peak summer period offer good value for money, temperatures are that little bit more comfortable and the area is will have less of a "busy" feel.